Trump, who goes back and forth about what he accepts about the years-long campaign of “active measures” against the West, now says the cyberattacks, online agitation and other techniques could be turned against him and Republicans in the 2018 congressional races. It wasn’t immediately clear whether Trump’s warning reflected an intelligence briefing he has received about actual Russian activity or whether he was simply “trolling people,” as House Speaker Paul Ryan put it on Tuesday. Top U.S. officials have warned they expect Russian attacks to continue through 2018 and 2020. Director of National Intelligence Dan Coats said in Washington that the warning lights are “blinking red” about foreign interference, and Deputy Attorney General Rod Rosenstein issued a warning of his own last week at the Aspen Security Forum. The U.S. intelligence community concluded, with a subsequent endorsement from the Senate intelligence committee, that Russia’s active measures in 2016 were intended to hurt Hillary Clinton and help Trump get elected. 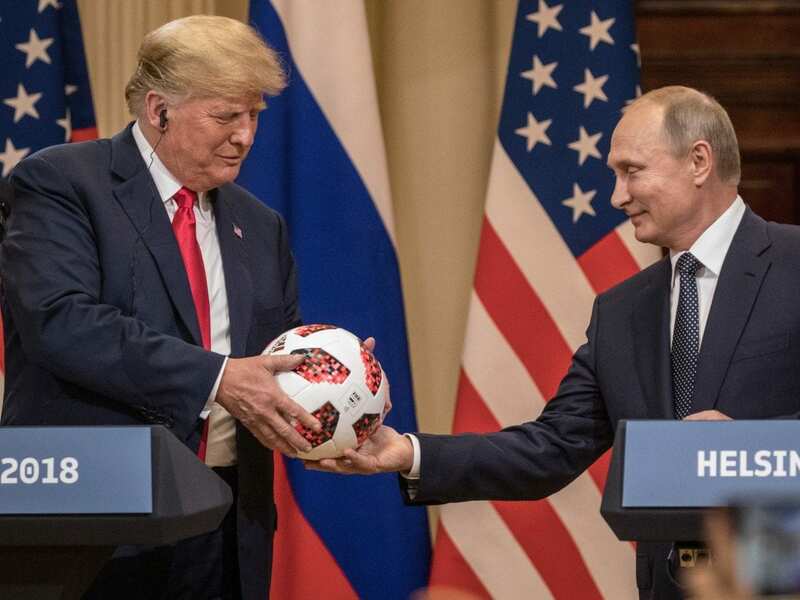 Russian President Vladimir Putin said in Helsinki last week that he supported Trump in 2016 because of Trump’s conciliatory outlook toward Russia. Trump, meanwhile, goes back and forth about what he says he believes or accepts. Last week, the story ran again in microcosm over the course of several days: In Finland with Putin, he said he didn’t see any reason why it had been the Russians that interfered in 2016. Then he said he meant to say he accepted that they had. The goals, according to this view, might be more political ugliness, a reduced likelihood of successful legislation — because Trump would be unlikely to sign bills passed by Democrats — or other work by new Democratic majorities to try to hurt Trump politically. Republican Sen. Lindsey Graham wrote on Twitter that Trump’s warning underscores how much Republicans and Democrats need to work together to fight foreign interference, since the tables can turn against either side. Then-FBI Director James Comey told the House intelligence committee in March of 2017 that Russian cyber operatives also targeted the Republican Party or related organizations or people at the same time they were accessing the systems of Democrats to hurt Clinton. But the Russians did not release what they stole from Republicans. They could begin to do so, or unleash the results of ongoing cyberattacks or take some other action between now and Election Day — for example, try to increase the volume on political controversy inside the United States by using Twitter and Facebook and other social networks as was the case in 2016. At the same time, Big Tech observers and others have suggested they don’t detect the same kind of surge taking place this year as they did in 2016. At the same time, she warned, Americans are now better prepared for an attack like the one that surged in 2016 and has continued in other forms since then. So Nielsen said the nation still must be on guard for some new version and there is still time to run before Election Day.